In loving memory of our beloved Fred who stole our hearts when he came to us in late 2001 and we were then blessed to have him as a part of our family until a summer day in 2012. Fred was an amazing Basset, he was very funny and extremely smart. He loved to hop up into chairs and would always steal your seat as soon as you stood up...we still find ourselves turning to see him in our chairs, then realize he's not here with us anymore. Fred had a long and full life, but we still weren't ready to let him go. We will miss his kind and loving heart, he was a good Papa & brought happiness to a lot of lives with the puppies that he fathered over the years. We love and miss you Fred and you will be in our hearts forever! 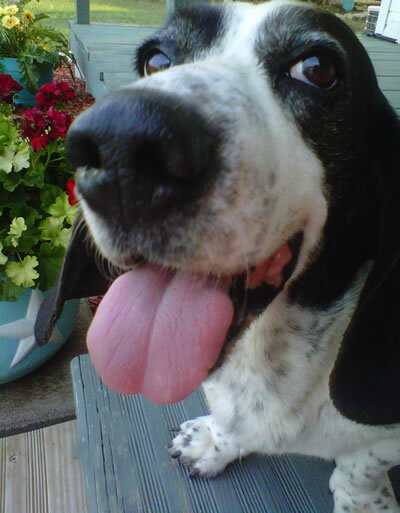 In memory of our precious girl that we called Big Momma, named so not only because of her large size, but because of her caring, nurturing and loving ways to all the other bassets, as well as people. Big Momma joined our family in May 2007 and the Lord called her home on Friday, March 7, 2008. While carrying a litter of three puppies to full term, Big Momma developed an infection in her uterus, discovered by her vet when she went into labor. The doctors assumed that the puppies were not alive, but attempted to save Big Momma with an emergency surgery to remove the non-living puppies and the infection from her body. It was a miracle to find that the three puppies she was carrying were all alive! Both Big Momma and the puppies made it through the surgery, but only a few short hours later, Big Momma passed away. We will miss Big Momma's sad face, her hilarious bark, and her laid-back, sweet and loving personality. Her presence is greatly missed and we will always hold a special place in our hearts for Big Momma.